When my 707’s opened up it was almost like a light switch especially in the bass department, the front end is so good its almost like having two subwoofers in my system with my SVS in the back of the room.. These will be with me for many years if not forever as I don’t see any reason to swap them out, Polk would really have to out do themselves for me to even look at them.. Thanks for your insights. I was listening to 10,000 days when I got home today and I got chills on the back of my neck when the pot came on. Absolutely unreal how good these sound. Not quite at where the InnerSound ESL hybrids were or the Von Schweikert VR2's were but the 705's are within spitting distance. I actually like the look of the LSiM line with the beautiful wood veneers and the lacquer front ends. The oval Cassini woofers look different than any other home audio speakers I've owned. I really like the curved cabinets as well. Pretty sharp! The 705's would have been mine ages ago if I could physically move them, but they are too heavy for me so that was a pass. Fortunately the S60s came into being, and I'm a happy camper! Victor, if you call Conrad-Johnson they will tell you that Steve McCormack is no longer there.........just saying ya know. Yes, I caught that thread. Thankfully, SMC is up and running in California! Victor if you want to try a good tube amp on those let me know. I might be able to work something out for you. I've got a couple units on a reviewers tour right now. That's a very kind offer Skip! Cathy will rake me over the coals if I'm running the 705's on some flea watt tube amps! lol! It's actually funny that you mention the tube amps as the last amps I had on my VR2's were TAD-60's (from the late, great, Paul Grzybek of Tube Audio Design and Bizzy Bee Audio) bi-amping them (EL34's up top and KT88's on the bottom). Congrats Victor. While I have limited experience with the S60 or the 705, my brief experience tells me its no contest. 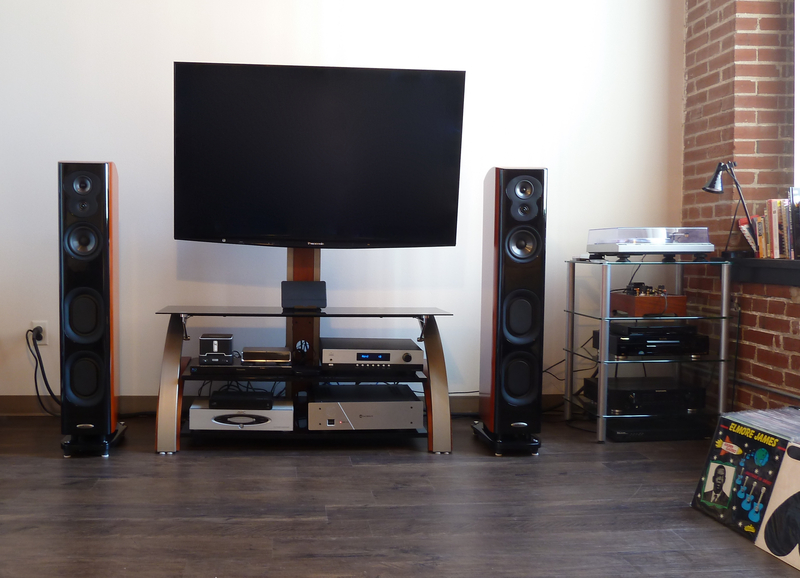 The S60's are a great speaker, but they just don't match the LSiM in either looks or sound. I really, really enjoyed my 703's and it took a great deal on a pair of Usher MD2's to move them out of my room. Thanks & thanks for the input! Those Ushers are no joke; An end game speaker for some. I've yet to get my ears on the brand but I've heard (no pun intended) nothing but praise. Cathy, You just need to get some sliders under the feet. You move them a few times until they're in the optimum position and you're golden. If we can do it, you can do it! Not to mention hand trucks, furniture dollies and leverage. HUH ? Cathy....who has no problem throwing a 200 lb. man across a room is complaining the 705's are too heavy ? Your room cleans up nicely. Took my 705’s about 75 hours to start opening up. Seemed to notice improvements until about 100-120 hour mark. Lookin' good Victor... and I'm sure SOUNDIN' better! Congrats. That McCormack is a sweet looking amp. Thanks That seems to be the consensus on the time to break them in. Thanks Al! Hasn't really been sounding "bad." lol. It's a manly man's amp. How are the Monitor / Model / RTA 11's ? Saweet! Just in time for the weekend. I should have gotten the cherry ones instead of the midnight mahogany. Saweet! Just in time for the weekend. I should have gotten the cherry ones instead of the midnight mahogany. IDK about that. Both finishes look great. There are cherry accents on the AV rack so now I finally have a set of speakers that match (somewhat). I’d think that the midnight mahogany finish goes with darn near anything in comparison to the cherry. Nice looking set up. Mine are still on backorder? Do they come with spikes for carpet? Yes, the rubber feet are placed over the spikes from Polk Audio. You just pop off the rubber feet and the spikes are there. The apartment building did the plastic composite flooring right before we moved in. Well all of the trim, doors, cabinets, and some of the floors are finished in a cherry stain. I don’t remember my reasoning for not getting cherry, maybe they weren’t available idk. Your 705s look good with the exposed brick wall too. Maybe you had too much cherry and you wanted a contrast? Thanks for the compliment! When I bought them, I didn’t have a choice. It was only the Mt. Vernon Cherry finish that was available. I do like the look of the Midnight Mahogany. Unfortunately first I would have to tip the speaker to push the slider under it. Between my easily collapsing thumbs, and my worn out elbows, I'm not willing to risk hurting them. You all would take the risk even knowing you probably shouldn't, I'm smarter than that! But I love my S60s, they look great and sound terrific. Between my easily collapsing thumbs, and my worn out elbows, I'm not willing to risk hurting them. I have a vision of you dancing like Elaine!